20 Avenida La Antigua is a spacious one-bedroom, one-bathroom flat that can accommodate up to five people. 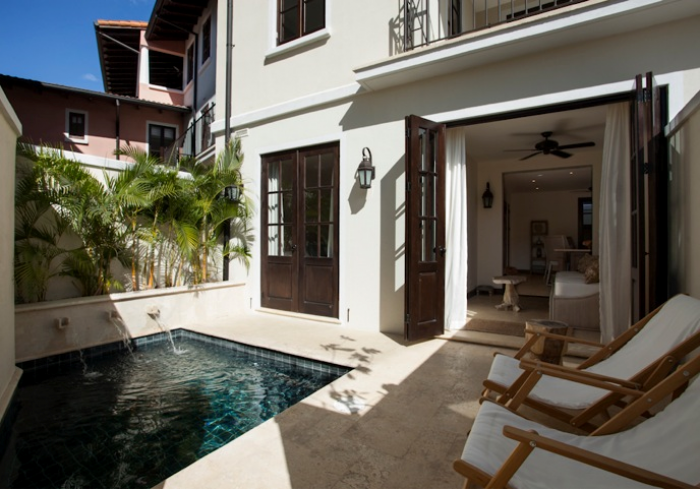 One entrance brings you directly into the living room, while the other leads you to a private courtyard featuring a cozy plunge pool and lounge chairs. Wood-paneled folding doors in the courtyard lead to a day room, blurring the lines between exterior and interior space. In the day room, you will find a day bed and a trundle that accommodate up to two guests, and should you wish to fit in one more guest, the living room offers an extra day bed. The master bedroom features a queen size bed and shares access to the full bathroom. Embrace easy meal preparation in the fully equipped eat-in kitchen. This extremely versatile flat is perfect for couples, small families, or friends traveling together. All flats feature two common areas you will not want to miss! Get your grill on in the barbeque area, or sit back and admire the sunset under the pergola on the upper deck. Each common area has its own bathroom. Additional amenities include a laundry room with washer and dryer.